(Bloomberg) -- An air of relative calm has descended on Asian equities. And that’s no wonder: with a number of potential market catalysts to come, investors are in wait-and-see mode. That’s leading to a pause in the Asian stock-market rally that lifted the MSCI Asia Pacific Index 5.3 percent in January -- on track for its best month in a year. 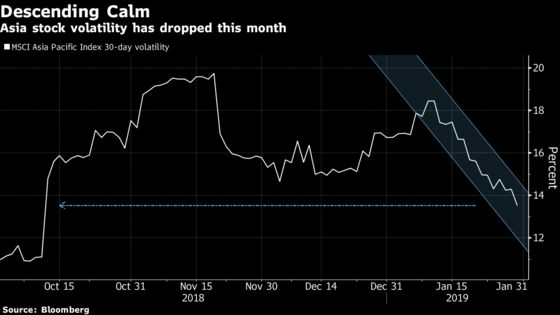 For the past three days, the regional benchmark moved 0.2 percent or less, sending its volatility to the lowest since October. “Today could be a crucial day for financial markets, with the U.S.-China trade discussions set to open in Washington and then the FOMC delivering its latest rate announcement and statement,” said Nick Twidale, the chief operating officer of Rakuten Securities’ Australian unit. “The market will be looking for solid progress before a real rally can take place,” he said, referring to the trade talks. While Treasury Secretary Steven Mnuchin said in a Fox Business Network interview he expected “significant progress,” prospects for a conclusive agreement remain slim. The U.S.’s unveiling of criminal charges against Chinese corporate giant Huawei Technologies Co. this week isn’t helping the mood. The trade war has been casting a shadow on the world’s two biggest economies, and China’s weakening is roiling the rest of Asia. From Hong Kong to Japan, December exports data showed a marked downturn. Nikkei PMIs for seven of the region’s economies are due Friday, with four of them already in contraction or near one. Even Apple Inc., whose encouraging outlook lifted its shares, said its sales slumped in the holiday quarter partly because of China’s slowing growth. While the MSCI Asia Pacific Index reversed a drop of a much as 0.3 percent on Wednesday, Shanghai and Shenzhen closed in the red. Commodity producers were the highlight, with the sector rising to an almost two-month high amid gains in iron ore. Rio Tinto Group and BHP Group surged in Australia as much as 7.3 percent and 4.9 percent, respectively.